A neon mural commissioned by the City of Norfolk in the NEON district to accent the original "Explore" mural done by John Hickey. Space Explorations depicts various subject matter of space exploration. The Artist would like to thank: Ali Feeney, Brian Riehl, Brian Strotz, Creative Sign Builders, Jesse Scaccia, Charlotte Potter, John Hickey, Riehl Deal Sign Company, Mike Day, Exotic Home and all who supported the crowd funding effort to make Space Explorations a reality. Art House Neon, 2015, Commissioned by Art House in Richmond VA for the InLight festival 2015. 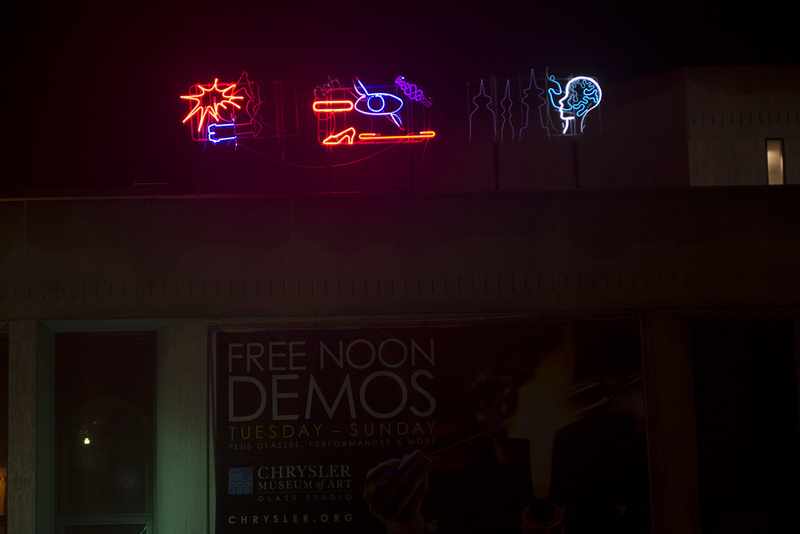 The Chrysler Museum of Art, Neon Roof Gallery was created in response to the dull color of the buildings at the Chrysler Museum of Art, the lack of space to display student neon work, and the NEON arts festival. The Gallery will display the playful and creative energy found inside the museum and glass studio. The Artist would like to thank: Charlotte Potter, Robin Rogers, The Chrysler Museum of Art, Gayle Formen, Joan Biddle, Hannah Kirkpatrick, Ali Feeney, Brian Riehl, Carmen Lozar, Devon Rinn, Toots Zynsky, and Jon Moreno, for their help with the Chrysler Museum of Art, Neon Roof Gallery.